Dr. Cronin became interested in implant dentistry early on and in order to incorporate it into the practice took a Fellowship with the Misch International Implant Institute, a course certified by the American Dental Association and the Academy of General Dentists. Dr. Cronin is a member of the International Congress of Oral Implantologists. These images show the differences between natural tooth structure and an implant. Though the difference is obvious in the diagram and x-ray, the function and appearance above the gum line is the same. When a tooth is lost, an implant is an excellent option for a permanent, fixed replacement. Unlike a denture, it is not removable and does not require fitting adjustments. Unlike a bridge, implants do not involve cutting (therefore damaging) and crowning the surrounding teeth. A dental implant exists in two main parts: the crown and the titanium base. 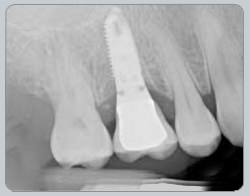 The implant itself is the titanium base, essentially a surgical screw that is set into the bone and allowed to heal, creating an artificial “root.” Once firmly embedded, a custom crown is fabricated to replace the tooth structure itself and placed onto the base. 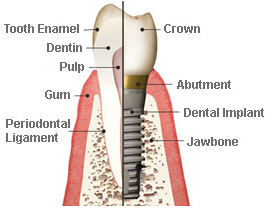 Each dental implant has an abutment (which come in different shapes for each tooth), that supports the crown above it.